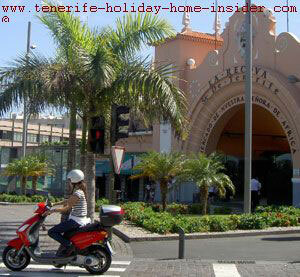 What's different about this Tenerife African Market? The biggest market of Santa Cruz is a Tenerife African Market indeed. It has replaced the former La Alcova of Plaza de Madera. This African Market is now the oldest city market on the island, as Garachico's was destroyed by a volcanic eruption. Hence, this new shopping facility was built in 1940 in a North African Style. It's called Mercado Nuestra Senora de Africa. That means 'Our lady of Africa Market'. 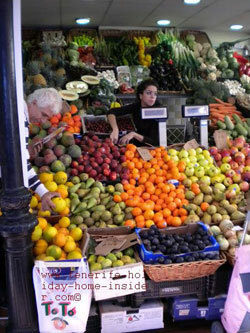 Don't arrive before 10 a.m. or after lunch when the market buzz is over, while stalls close by 3.p.m. In fact, this indoor Market with its prominent, roundish main gate is unique in the Canary Islands and is unlike any Spanish architecture. First Tenerife African market impressions. This city oasis dubbed African Market is enchanting your senses by colors, faint perfumes, smells and the sound of happy chatting locals. Buy one of those red, spiky, central African fruit, delicious, semi cured Queso de Cabra cheese or an indigenous Gofio sweet made with honey and almonds to surprise your taste buds. A bakery sells bread, rolls, cookies and traditional cakes, on occasion. Produce display of exotic fruit and vegetable with some from Africa. Pyramid display scheme for market produce. Equally sized plywood boxes full of goodies hit the eye. They are stacked up by a peculiar system. Contemplate them already from further away from virtually every angle. Everything is arranged in a pyramid display scheme by the back wall of the shop as well as on all other sides. The stall shown has a front with colorful Moorish Spanish mosaic tiles. Yes, that's Spain. Spain of Northern Africa in Santa Cruz Tenerife. All the potato varieties almost set a base theme with the stalls. There are so many types of them. Most are shown off up front at certain times of the year. Want to learn how potatoes came to Tenerife and what sorts there are? 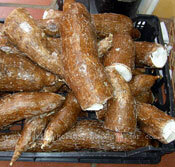 Yuca or Manioc Central African produce in Tenerife. Herbal shop Tenerife of 1000 herbs and spices. A Tenerife African market has to have a herbal shop. 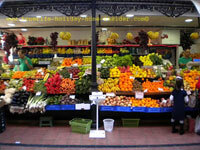 The one of Mercado Nuestra Señora de Africa is called Herboristeria Mil Variedades. That means herbal shop of 1000 varieties. Indeed, so far I have never seen a place which stocks that many herbs. The shop front has two entrances and hides most treasures inside. They are medicinal herbs or call them healing herbs. The Tenerife neolithic Guanche must have known some of them, already. Mind they also used herbs for mumifying their aristocratic dead. Wouldn't you also expect some rather rare stuff in this shop? pregnancy discomfort, you name it. I couldn't list all 1000 of them, as I didn't take stock. Go to the African market shop of herbs and spices with a good electronic pocket translator, unless you are already familiar with Spanish expressions for healing herbs. 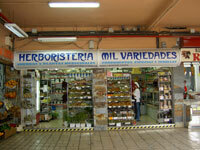 As said, there are also spices, while the precious Saffron is known to be cheap in Tenerife. What is so brilliant with the herbs of this corner of the African Market of Tenerife is again the way in which it is shown off. Herbal purpose explanations for medicinal cures. Poppies, seed cake and opium? 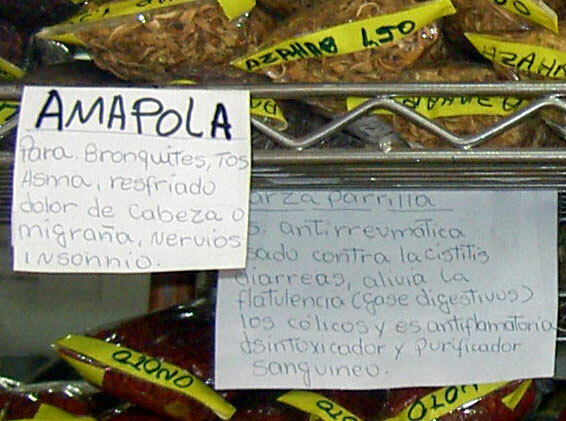 Notice display tags of herbal purpose explanations in this alternative medicine shop of the Tenerife African market. All its produce is tagged like that for the medicinal use of the herbs. 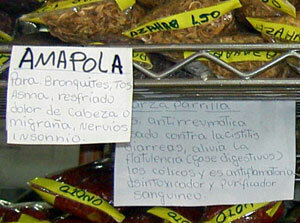 Depicted beside are two such display tags, one of which reads Amapola. It's noted that it cures common colds, Asthma, head aches, migraine, insomnia and is good for the nerves. Amapola is the poppy seed which is edible to an extent. You can bake poppy seed cake even for Christmas. It's delicious. Opium is made from a specific poppy flower, one of which is blue. Expect Amapola poppy seeds and many of the other herbs to work like food supplements to help cure something. By the way, there is a market stall with German breads and pastries at the Santa Cruz African Market where you can buy such cake to find out what it's like. What a perfect way of marketing by display tags near the merchandise. Of course, you should still research a bit further. Use your smart phone with the markets free WiFi. Certainly, you may also consult the study center library of the T.E.A. over the road. It also gives you a free Internet in the T.E.A. library. 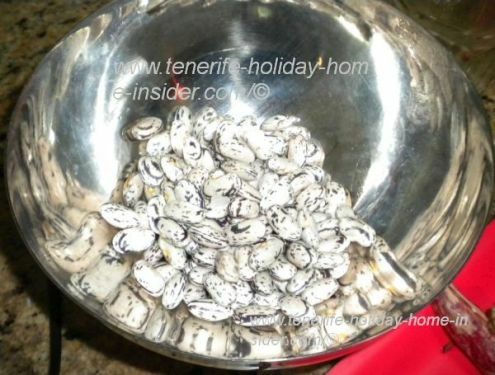 Otherwise, consult your doctor before taking alternative medicine from the Tenerife African market. A new European law is said to be introduced where only pharmacies may sell herbs in the future. Are you also set against this? Anyway, this brilliant show of a myriad of colors and shapes of the African market is a way of life in Santa Cruz, while it draws tourists and locals like a magnet and is bound to make you happy. Want rare produce,condiments or spices? 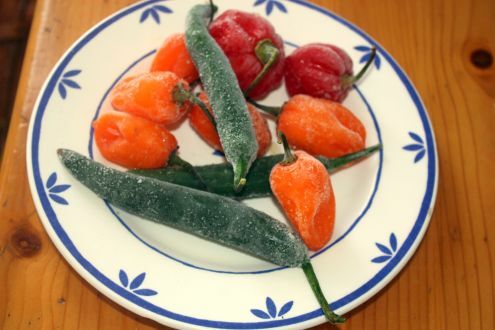 You can even buy the hottest chilly in yellow, red, or green, usually frozen and much more, at the Oriental shop of the new Alcova the African Market in Santa Cruz. Ghadra alias Borlotti or Cranberry beans in their pink-brown pods. There is a Gomeran produce corner shop that is almost next to it. This place is a real, fresh vegetable treasure trove. 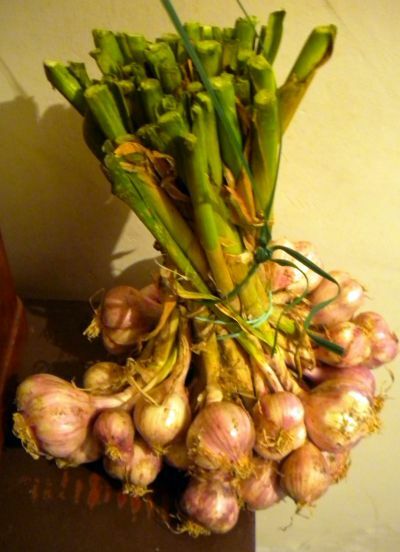 It sells the best Garlic, Ghadra beans also known as Borlotti or Granberry beans, dainty Shallots, you name it. 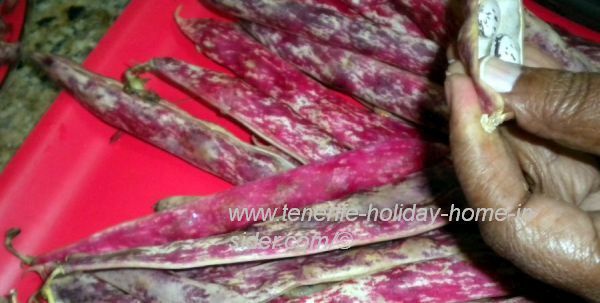 Cranberry beans also called Ghadra beans for curries or Borlotti beans. What's not African with this Tenerife African market? There are no real market sounds that remind the dark continent. You miss the snake man. No reptile is dancing to the tunes of a flute. Also, no camel noises remind the desert. Just figure, there was some of it coming from the background. However, cordial vibes abound like on the neighboring hot continent. There is a saying that the Tenerife African market's produce comes from the land, while it's people are much down to earth and easy to get on with. More than 150 sellers feel at home there like part of a big family who stage their own fiesta celebrations from time to time. It's a place which has its own stories and legends, some of which are connected to the sea. 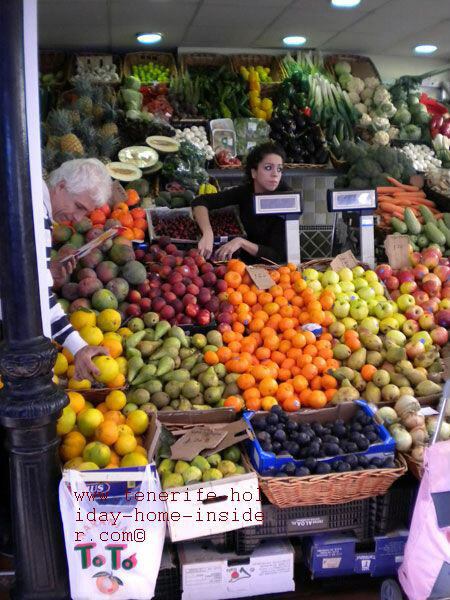 In short, the African Market Nuestra Señora de Africa is a Santa Cruz de Tenerife social playground. The beauty about it is that any tourist feels welcome there which makes it one of major Tenerife attractions for things to do. Learn more about the Tenerife African Market of the Canary Islands in the context of shopping in Tenerife where the flea market of Nuestra Senora de Africa is part of. How find this main African Market? Consult the handy itinery Map central market district with 5 more attractions. 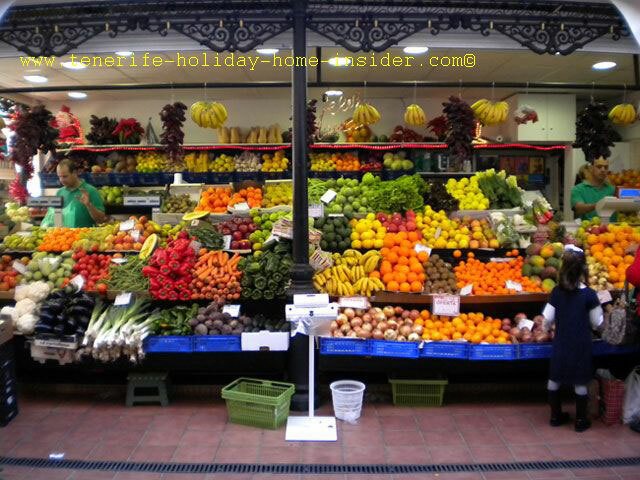 The Tenerife African market Nuestra Señora de Afria is located near by the Lion Bridge of the gorge Barranco Santos next to La Noria the Tenerife capital party street .. It's opposite T.E.A which sometimes has museum exhibition events. Indeed our Mercado of Africa complements the T.E.A in a charming way. Here again, the traditional and the modern join hands. In November 2013 i saw the owner of Fruteria M Carmen where I've been shopping since 2001 almost daily fill Amapola seeds into little see-through bags. Carmen told me that she's had them for many years. There was too much in this small miracle shop by Puerto de la Cruz. Why was? The owner retired in 2014 but, I keep the article online for interest's sake. From Tenerife African market back to shopping in Tenerife where you learn about more markets markets of all sorts as well. There is another option to speak your mind for all who want to share with Facebook by scrolling further down.